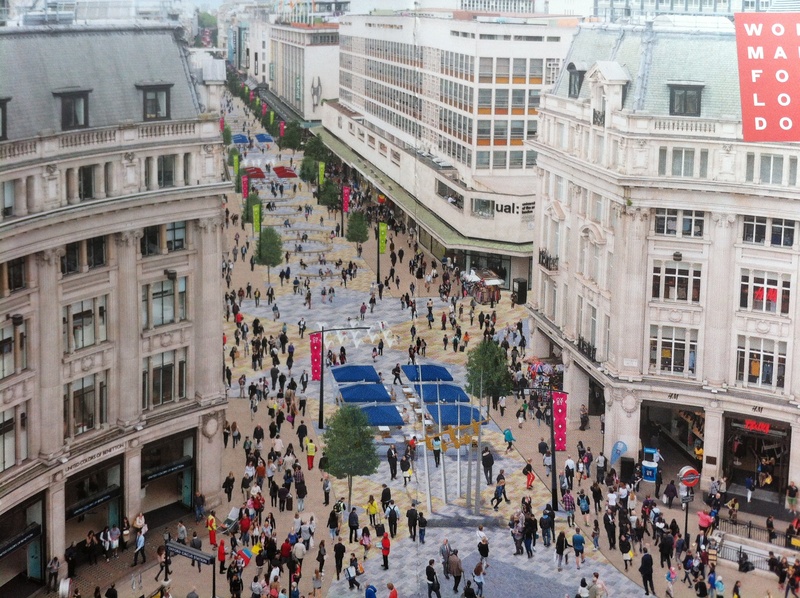 Caption: An image of a traffic free Oxford Street from one of Labour’s 2016 Mayoral candidates, Christian Wolmar. “1.The street is embedded in the centre of a very large source of NOx i.e. London. 2. It is completely dominated by diesel vehicles (buses/taxis) and has among the highest flow of buses of anywhere in the UK. 3. A large fraction of the bus fleet uses technology based on CRTs (Continuously Regenerating Trap) and similar technologies that deliberately produce increased emissions of NO2, as described above. NB NOx is a generic term for the nitrogen oxides NO and NO2 (nitric oxide and nitrogen dioxide). NOx reacts with ammonia, moisture, and other compounds to form nitric acid vapour. Small particles can penetrate lung tissue and damage it. Inhalation of such particles may cause or worsen respiratory diseases, such as emphysema or bronchitis and may aggravate existing heart disease. µg/m3 is a measure of an air pollutant and is in micrograms (one-millionth of a gram) per cubic metre air. So what’s the answer: currently don’t visit Oxford Street unless there is a bus strike on. When buses (and taxis) dominate then don’t breath in. It is ironic that traffic in Oxford Street is regulated by Transport for London who have promotes diesel engined buses and taxis. The mid-term answer is to pedestrianize the whole street and provide a people mover for the old, slow and tired or those burdened with shopping, or those who just want a ride. A people mover is modern jargon (always use many words instead of one) for a tram, Ken Livingstone floated this idea a number of times when he was mayor (2000-2008) and in his failed campaign for mayor in 2012. But Westminster Council opposed his proposals. Robert Holden is a London-based landscape architect who read architecture & landscape architecture at the University of Newcastle-upon-Tyne. On graduating he worked for the Dutch Staatsbosbeheer (State Forestry Service) on a visual survey of Oostelijk Flevoland and for Allain Provost in Paris on recreation planning of the French coastline east of Dunkerque. In London he has worked for Derek Lovejoys (1971-75) and Clouston (1976-89) including extensive work in the Middle East. •	In the 1980s he was particularly known for his work on business park masterplanning such as Aztec West near Bristol, Capability Green Luton and Colchester Business Park. He was a Clouston director responsible for bureau d’étude work at EuroDisneyland in 1988-9; •	since the 1990s he has been involved in smaller practices (including Clifton Design 1990-91 and Holden Liversedge 1991-99), and Cracknell Ferns (1999-2009). •	projects have included work in France, Germany, Kuwait, Libya, The Netherlands, Saudi Arabia, Spain, UAE, and Russia as well as the UK. •	he was lecturer, latterly Head of Landscape & postgraduate landscape architecture programme leader at the University of Greenwich, 1992-2013. •	Currently he serves on the Landscape Institute Council having previously served 1983-86; he was Education Vice President of the European Foundation for Landscape Architecture (2001-4) & from 2005-2008 was EFLA Secretary General. EFLA is now IFLA Europe. •	From Feb.-June 2014 he undertook a Tübitak (Turkish Science Research Council) scholarship, at Istanbul Technical University, looking as sustainability & public domain in Istanbul. In 2015 he taught at Corvinus University on their MLA. Interests include sustainability & landscape architecture, post industrial landscapes, landscape construction, the European landscape profession, and aspects of C18th landscape gardening, especially the ferme ornée. HIs latest book (joint with Jamie Liversedge) is "Landscape Architecture as a Career": Laurence King (Feb. 2014) in English and Spanish.